A real disaster for any family – the appearance of the apartment hordes of ants. These prolific insects quickly mastered the new place and multiply with incredible progression. They live "Pharaoh's ants, a huge community under the leadership of the uterus. 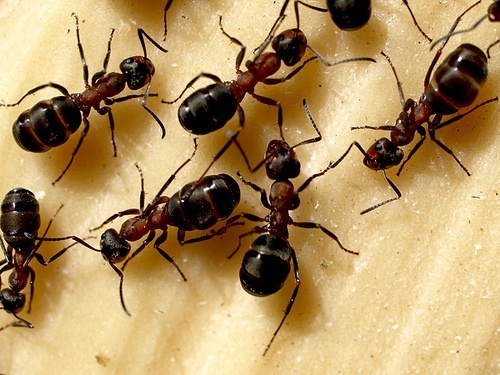 When searching for food ants-workers leave noticeable odorous trail for them to pave the way for their brethren. How to get rid of ants in the apartment? Get rid of ants in the apartment, you must first in order to prevent the transfer of diseases that are capable of spreading these insects as well as mice, cockroaches, rats. They occupy any food object that can penetrate into every tiny space, any gap. The discomfort of their stay is evident in everything: eating foods in the house, they cause diseases of the intestinal tract; damage the insulation of electrical equipment in the house, crawl on human skin and carry infectious diseases. So to get rid of ants in the apartment you need in the shortest possible time after their discovery. Of course, success will depend on the design of flats, the opportunity to expand the bait in the appropriate places of permanent residence of ants. Because the nests can occur as behind the baseboard and a small incision behind the cupboard in the kitchen where the crawl is simply impossible. Don't forget that there are times when the ants the nest form outside the apartment, but the meals come there. First we need to stock up on boric acid that is sold in any pharmacy. Boric acid mixed with products that are so fond of ants. This can be ground meat or chopped boiled egg. These baits should be put in an accessible environment, so residues can be removed, otherwise the presence of ants in the house added to the putrid smell. This bait is perfect for hard to reach places. To boric acid you need to add a little honey diluted with water. The ants will gradually peretekut poison in the nest, destroy it, and get rid of ants in the apartment will become much easier. Very well helps the bait of yeast and boric acid. This mixture should be rubbed with a small amount of water and sugar and put in places of stay of ants. Track ants you can sprinkle grated garlic or parsley. The edges of the baseboards and table cabinets can be greased refined sunflower oil. The smell will repel insects, they will go without food forever and leave the apartment. If the bait did not help, and the ants continued to attack the accommodation that you need to buy special means for their destruction. In order to get rid of ants in the apartment, it is necessary to conduct the above activities in time. But to avoid the insects should be carefully monitor the cleanliness of the room.